Daily, we are reminded of the pressures that students returning to class – or enrolling for the first time – experience as they arrive at universities and colleges around South Africa. Just this week we have been bombarded with images of students sleeping rough at CPUT, and tales of intimidation and potential conflict as student bodies at Wits, UJ and TUT take up the cause of their fellows whose desire to return and re-enrol is being pre-empted by a lack of funds. And there’s the almost constant hiss of the word “NSFAS” underpinning all. The National Student Financial Aid Scheme, used right, and with deep-enough coffers, could give entrance to tertiary studies to many qualifying students. But, despite announcements in December and January of the increase to R9.5bn in the 2015-16 year for tertiary students (including those in the TVET sector), it is surrounded by reports of a pot of money inadequate to meet the requirements of all prospective students who qualify. The spread of funds to students does not address all their tuition, residence and living expenses, let alone books. Recently, Higher Education and Training Minister Blade Nzimande said that Government is underfunding higher education institutions by allocating only 1.4% of GDP to this sector, low even by African standards (‘Zuma says universities are too costly – Nzimande disagrees’, Mail & Guardian, 12 January 2015). He said that inflation in the higher education sector is higher than CPI, and interestingly, pointed out that the cost of imported learning materials and equipment – affected by the vagaries of exchange rates – is one factor to blame. Given that the very Minister tasked with providing more access for matriculants with Bachelor passes to universities has spoken publicly about the cost of learning materials, we have no hesitation in adding to a debate close to our hearts. 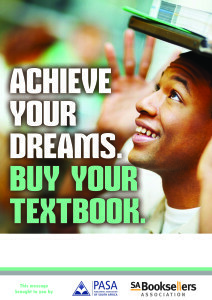 We believe textbooks give students access to success and must be part of the higher education funding debate. Especially because students are in so much need, they require textbooks. We have to talk about this, even when funding is an issue and students have other pressing needs like accommodation, transport and access, for precisely the reason that textbooks can create access and give the type of support to students that they need to pass and succeed. Even when there is a shortage of funds, textbook monies should be ringfenced, and textbook acquisition for their courses prioritised, so that students can pass and succeed. Let’s break that down into five key points: cost, relevance, curated content, digital content, and access. Cost. Dr Nzimande indicated that the high cost of imported learning materials contributes to high higher education inflation, and he’s right. What he didn’t highlight in his response to President Zuma’s comments during the ANC’s 103rd birthday celebrations in January is the plentiful availability of excellent-quality, local South African textbooks for higher education students – at reasonable prices. Local South African textbooks made by PASA publishers average below R450 for a new book. Prices are guided by the recommended retail price set by the local publisher, and informed by the cost of researching, commissioning and quality-assuring the work, the payment of royalties to South African authors, and the distribution costs to get the book (print or digital) to students. Let’s be clear that local publishers do not collude to set prices – they have not agreed that the price of all books should be, for instance R400 each. The latest industry survey from PASA, made available in December 2014, steers completely clear of indicating the average or even recommended price of locally-produced undergraduate university textbooks. So we’re not saying here what the price should be, except that when we read that some students are called to fork out R1,800 or R2,000 per book, we think that is unreasonable, and puts access to the learning packaged in that book, out of reach of a South African student. Relevance. It is easy to argue that where money is short, students should not be asked to spend on learning materials. We believe materials such as textbooks are absolutely crucial precisely because they give that student the opportunity to succeed. It is likely that although she has secured university entrance and is the holder of that all-important Bachelor’s pass, a student did not benefit from the best schooling available. She may not have the academic literacy skills to curate, work through, and understand the content necessary for her course. Even if she had excellent schooling, she may find that a first-year tertiary course in a subject that is completely removed from Grade 10 to 12 subjects, is a completely different kettle of fish. She may find that the level of support she can expect from a lecturer – who may expect the student to ‘just get on with it’ – is insufficient. There is a perception that the majority of learning materials used by undergraduate students are – like those for postgraduate studies – imported. But an additional truth is that major publishing companies such as Oxford University Press Southern Africa, Juta and Company, Van Schaik Publishers and Pearson, commission South African academics to write relevant local textbooks for undergraduate subjects. These books form the largest percentage of books made and distributed by these publishers. In local South African textbooks, the content is matched to local undergraduate syllabi. Take the example of an undergraduate Financial Management course. A textbook will both match the syllabus because it was written by local financial management academics and practitioners, and contain practical opportunities for the student to check his grasp of principles and practice the skills he needs. The content will be relevant, in that it talks to the international reporting requirements, but also uses local examples (an entrepreneur accounting for his own business, for example). Curated content. But in the day and age of free resources, and plentiful content on the Internet, should a student not be allowed – even encouraged – just to source his content from the web? PASA publishers believe that Open Education Resources have a place in higher education, and support the Department of Higher Education and Training’s quest to place OERs at the heart of more higher education in South Africa. We know that while there are excellent OERs available – particularly in the sciences, and particularly at a post-graduate level, and through reputable open access journal publishers – many so-called OERs have not been vetted or quality assured. Importantly, the content is not curated. We mean that at a South African university, the undergraduate course has a syllabus which relies on specific content to explain specific basic principles and provide a framework for future understanding. Textbooks, by definition, curate content. And contrary to a popular misunderstanding that they merely represent greedy academics who publish their own notes to cash in on the needs of a captive class, the majority of textbooks in South Africa are the result of careful research by experienced publishers, are commissioned to be written by multi-author teams, and are backed by the publisher’s experienced addition of pedagogy, and peer review. The era of ‘garage publishing’ is gone. Credible universities follow strict guidelines when choosing to prescribe a textbook, evaluating how it will meet their teaching needs, and the learning needs of the students, before making the decision to adopt the book for a course. We know that lecturers are very aware of the requirements of their students. They are concerned that the language level must be right, and the content accessible, to their students. The content must be scaffolded, and provide opportunity to practice. They know that price affects students’ ability to buy. These elements are central when they make the prescription decision. What about digital? Ah, but is the textbook still alive and kicking in this day and age of e-books and digital resources? Good question. By “textbook”, we mean either the print or digital version of the book – the content in a print format for students who prefer that, or in e-book format for students who do have access to laptops or tablets required to consume it. South African higher education publishers are making textbooks in both print and e-book format (read: EPUB, or pdf), and distributing these through regular bricks-and-mortar bookshops on or near campus, or through local e-retailers. So the lecturer making the prescription decision can advise students that the book is available in print or e-book format, whichever suits. And the lecturer can further – through his faculty head or the university’s procurement division – negotiate the bulk purchase of e-books from a publisher and via an agreed distributor. When we talk about “textbooks”, we are not stuck in the Dark Ages. We refer to the curated content, with supporting pedagogy, for a university course, that is contained in a print or e-book. Access. In a nation where underskilling leads to endemic unemployment or underemployment, isn’t it important that wherever possible, a student who gains access to higher education – whether at university, university of technology or college – has the best chance of succeeding? Textbooks have a key role to play in the provision of teaching and learning to undergraduate students. They can make the difference between a student understanding basic principles – despite lack of exposure to a subject and a lecturer whose attention is spread across a large first-year class – or being one of the cohort of up to 50% who drops out of Year 1. Higher education is not just about getting into tertiary studies. No, higher education is about each student progressing through the undergraduate course, grasping the concepts, being able to apply them, understanding the relevance in a local socio-economic environment, and figuring out how it all fits together in a global context. And that’s what textbooks, print or digital, do. That’s why, even in the midst of funding chaos in the 2015 “back to university” season, we must talk about textbooks, and ensure they get into the hands of the Class of 2015. This article was originally written for The Sowetan by Mpuka Radinku, Executive Director of the Publishing Association of South Africa (February 2015). I do not understand the problem. When I started studying I did not have money, I was forced to work and study part time (actually I studied first year up to doctorate degree – ALL PART TIME). I did not have enough money for accommodation and used the university bathrooms at the swimming pool. I slept outside for a number of years. I had problems that I had to work to get food and tuition fees. A problem was that I had to work at times when I needed the time to cram for exams. If I could do it, then why can the modern students not do it? The world does not owe the students, if they want to study they have to make the sacrifices. Today I appreciate my education, because I suffered to get it. I am aware of the fact that poverty is a big problem in our country and the economic state of the country as well is not favorable. My major concern is the sentiment that seems to be growing that students can make it through their studies without textbooks. The danger of this message is that the students will develop an attitude towards reading and stand on the belief that it is possible to acquire a qualification without reading textbooks. We are rated very low in as far as reading is concerned, and it would seem we are not even bothered to improve on this. Every thing is very expensive and we are all feeling the pinch but my appeal is to give education the first priority. I do not believe that the government of the day has the capacity to give free tertiary education, let alone the corruption that has plagued our country in almost every sphere. Let us all motivate our students not to be too dependent but devise means to achieve the quality qualifications for them to be able to make a difference in their respective fields. We cannot make it without the use of textbooks.